I'm not sure if I've ever mentioned this before about Tom Becker, but he is rapidly becoming one of my favourite authors. Therefore, when I received this book in the post I was very excited to read it. Especially as it is a book that I have really wanted to read this year. This is the seventh book that has been published so far by Tom Becker and I hope there will be many more to come. He has written five great books in the fantastic Darkside Series. However, the sixth book 'The Traitors', which is Tom's first standalone book, is one of my favourite reads from last year and has been longlisted for the CILIP Carnegie Medal 2013. 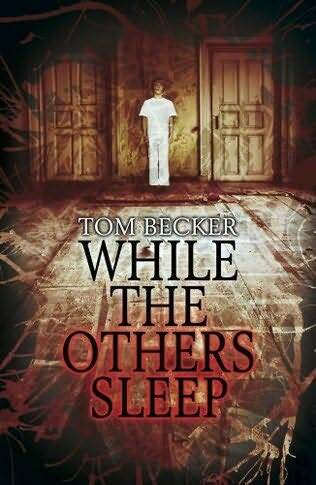 With this book, While The Others Sleep, Tom has pulled out another cracker. He has written a good, old-fashioned, supernatural thriller that will surely become a classic one day. Alfie Mandeville is the newest patient to be sent to the sanatorium for children. Sent by his father for treatment to make him better, as he suffers from sleep insomnia, he finds himself in a complicated situation. Be warned that reading this book will not help with the curing of any sleep insomnia. Alfie tries to uncover what is going on, but he ends up wrestling with his need for a logical explanation against his sleep-deprived imagination. Scarbrook House is a sanatorium for wealthy children, it's a fantastic setting for this book. Picturesque on the outside whilst creepy and edgy on the inside; it's a dark place full of twisted secrets. Terrible things have happened within the house and are still continuing to happen throughout the story. This book delivers a mixture of both supernatural horror and mayhem. Many of the characters have an eerie and disconcerting quality about them. Each character has a story to tell; they are all patients with sinister ailments that need to be overcome. However, they all seek treatment from a rather drunk Dr Grenfell who, in my opinion, needed a little bit more life injected into him as a character and perhaps more background detail in order to enhance the story. I think that you will love this book as much as I do. You may find that there are some similarities with another book (e.g. stately building with a twisted historical past told as a psychological thriller) that I have already reviewed this year, but that was also a cracking book. This book finishes with a climatic seat-of-your-pants experience. It is written in a very clever way with some amazing touches of imagination. It is a book that certainly lived up to my very high expectations and in more ways then one. I am looking forward to reading the next instalment.